It has been requested that this article be rewritten and expanded to include info on second battle. 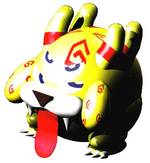 Belome is a dog-like monster that is perpetually hungry and a minor boss featured in Super Mario RPG: Legend of the Seven Stars. He is encountered by Mario and Mallow in Kero Sewers and by the whole party in Land's End. During the first battle, the monster will eat Mallow after a few turns. Mario can rescue Mallow by attacking Belome continuously, although Belome may still eat him subsequent times. If Mario falls while Mallow is in Belome's stomach, the game will end. Besides eating Mallow, Belome attack's includes licking his opponents and casting S'crow Funk. In the rematch, Belome trades S'crow Funk attack for more sleeping spells, including Light Beam and Aurora Flash. He also not only eats party members, but also creates clones of them. If Mallow uses Psychopath on the clones, their thoughts reflect the actual characters' thoughts, with the exception of Mario, whose "....." is a reference to his role as a silent protagonist in the game. In the English version, all the clones are known as "X Clone", with X as the character's name, except for Toadstool's "Toadstool 2" clone, to stay under the character limit. Before entering Kero Sewers, Mallow advises Mario that "his grandfather" told him to "watch out for Belome", although Mallow does not appear to know what Belome is beyond his name. 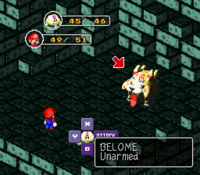 After exploring the sewers, Mario and Mallow enter a large, mostly empty room with Belome standing in the center. Mallow panics upon realizing the monster before them is Belome, who then attacks them. After battling and defeating him, he tells the heroes the cryptic message: "If you defeat me, you still won't beat me. Beware the flood!" and warps away. When he leaves, the ! Switch he stands on is released, causing the floodgate to open, with the water sweeping Mario and Mallow into Midas River. Later in the game Mario and his allies travel to Land's End, where they discover Belome Temple and find Belome in it. Mario's party again battles Belome and defeat him. After this battle, Belome declares he's starving and disappears for the rest of the game. However, if Mario and his party travel back to Belome Temple, they will discover a golden Belome statue guarding a room full of treasure. If Mario presents the statue the key from Monstro Town, the golden effigy will eat the key and disappear, allowing him to claim the treasure for himself. Psychopath "Gotta yummy in my tummy!" Psychopath "Ma? Pa? Where are ya?" Psychopath "It's tough to be pretty!" Berōmu Belome. Comes from 「ベロ」 bero, a colloquial word for tongue. This page was last edited on March 5, 2019, at 13:50.